#5 I think that it is long overdue for the middleman to be cut out. It has already begun to happen in academic journals where people often have to pay both to publish and to even see their work once published. These guys are gatekeepers who often have axes to grind and who often take all the profit. Given the state of the art, I suspect they add little value. #4 I have already seen some pushback such people dropping out of Facebook because of the loss of privacy. #3 Apple will most likely join this fray with the long rumored Apple Television set. http://tinyurl.com/7qxhu8s They are masters at simplifying the interface. I suspect they will add games in the process. Apple is the North Korea of consumer electronics so we won’t know until they announce something and who knows if it is smoke. But if the rumors prove true, will they do to TV what they did to music? #2 Already, I bake bread with the help of the cloud. #1 Netflix and Best Buy both have the same problem — customer deafness. A recent Forbes article predicts the slow death of Best Buy because of it. My own experience there makes me believe Forbes is right. They could have written the same article about Netflix. If somebody comes along with a real customer focus such as King Arthur Flour has in the baking biz, Netflix is toast. Thanks for the comment. You made some great points. The middle man will disappear in a lot of industries. I’m excited to see what Apple brings to the table (fruit table?) too. I’ve got an Apple TV box…and I think there’s a ton of room for improvement. Apple’s foray into the TV market will make things interesting. Will it become another Apple-dominated category? It’s 2013. How did you do? Hey, Jay. Thanks for asking. Let’s recap my Top 5 for 2012. 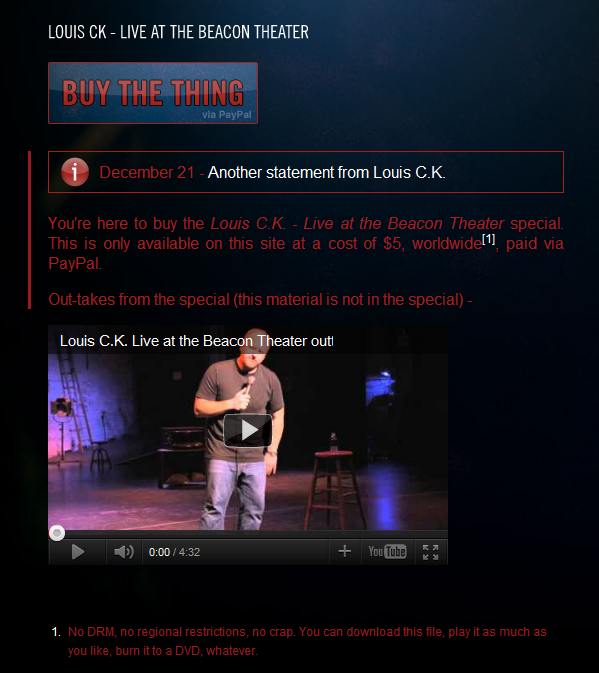 -Louis CK was the first, then others soon followed, including Aziz Ansari and Jim Gaffigan. This was totally spot-on. In fact, I predicted this before any of the systems even had apps on-board. Called this one too. Now when you buy a Blu-ray disc, it comes with a Cloud copy for Vudu. Other cloud services continue to expand. I was a little early on this one. Though Redbox Instant by Verizon launched in December of 2012. Could it be a fierce competitor? Time will tell. Amazon is also gaining steam with its Amazon Instant Video service. Other services could develop this year but Netflix has a strong hold. Exclusive content will really start to take over this year on streaming services. Watch for that.